Hello Truffle Lovers, The Black Truffle promotion has arrived at Oscar's Cafe & Terrace ('Oscar'). One of the must try ingredient for foodies is making its appearance in Oscar. Black Truffle is also known as Winter Truffle. Compare to white truffle, which normally harvested during summer in Europe, black truffle has a more subtle aromatic flesh. Black Truffle can be used as it own or can be incorporated with different ingredients to draw out the flavour. In Oscar, Executive Chef Michele Mingozze will be using the Black Truffle in different cuisines. From appetizers, Japanese, Local, Western and of course desserts. This tasting session really made me feel that I am at one of guest judges in the Iron Chef competitions, with the privilege of tasting how the chef uses and presents of the main ingredient black truffle in each dish. We started this Truffle Gastronomic Journey from the appetizers. Poached Quail Egg with Black Truffle Espuma; and Seafood Salad with Sliced Braised Black Truffle. The aromatic and subtle truffle paired with smooth and velvety poached quail egg is refreshing. Although the foam has dissipate, the truffle aroma still there. The seafood salad are fresh, but the truffle here is more refined. It was a good wake up call for our palate. Next Chef Mingozze brought us to Japan, represented with Miso Soup infused with Black Truffle; and Spicy Tuna Maki with Black Truffle. Personally, I feel that the truffle flavours are overwhelmed by the flavours of the miso and the spiciness of in the maki. For Western Cuisine, it is more of an Italian Affair and showcasing the strength of Chef Mingozze. White Asparagus, Parma Ham Chips and Black Truffle; Risotto with Black Truffle; and White Noodle with Black Truffle and Olive Oil Sauce. The aroma of the truffle just lingered in the air when the white asparagus are served. All the ingredients here comes together nicely and my favourite is the crispy parma ham. Tasted like bacon without the oil. Only one word to describe the Risotto, Fantastico! It is creamy, cheesy, flavourful, and the risotto rice is al-dente. It seems the risotto and the mushroom really accentuate the scent and flavour of black truffle in the dish. On the buffet line, the risotto will be cooked upon order. Similarly with the fettucine, the simplicity of this dish allowed us to taste the real flavour of the black truffle. A touch of crispy parmesan, just complete this dish. From the Local Section, we have Slow-roasted Pork Belly in Truffle Gratin; and Wok-Fried Slipper Lobster in Oyster Sauce with Truffle Oil. The pork belly is tender, succulent with a crispy crackling. You can feel the subtle flavour of the truffle in the sauce and the gratin on the pork. For the lobster dish, the flavour truffle very subdued. But I enjoy the well-cooked lobster. Finally for the sweet ending with truffles, there are 4 types of desserts you can savour: Chocolate Mousse and Black Truffle in Mini Cone; Strawberries and Black Truffle Fruits Porpourri; Pineapple Capaccio with Black Truffle and Coconut Foam; and Avocado Parfait with Black Truffle Confit. The strawberries and pineapple desserts are thinly sliced and infused with truffle scented liquid. The combination of fresh fruits and liquid infused truffle is just nice for those who like their desserts light. My personal choice of desserts are the Chocolate Moose. The chocolate made cone filled with chocolate moose, truffle and berry below is just how you say chocolategasm. It has the fragrances of the truffle, the richness of dark chocolate and the acidity of the berry to balance it. It is served on a bed of chocolate granules that you should enjoy slowly with the cone. Coming second is Avocado Parfait. It is smooth and creamy. The Black Truffle Confit, Chocolate granules and berries provided complementing flavours to the dish. 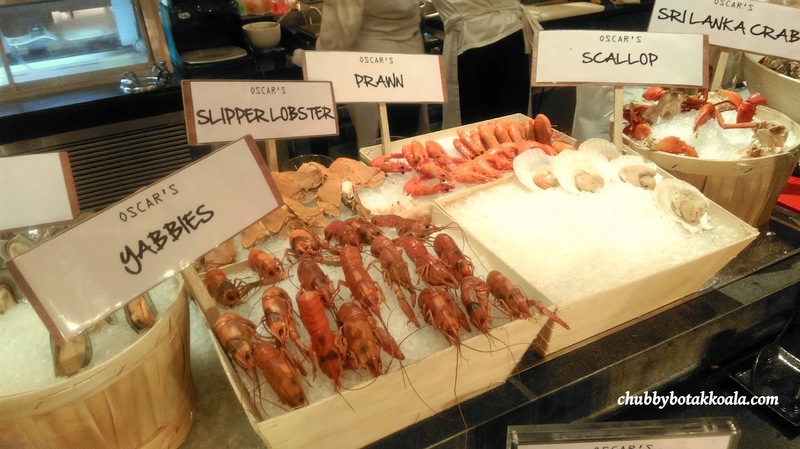 While it might be an Unearthing Black Truffle Events at Oscars, you can still enjoy the famous buffet line-up that Oscars are renowned for. The special for the current seasons are the three type of oysters to choose from: American, Irish and Canadian; fresh seafood such as Yabbies, Slipper Lobster (looks like crayfish), crabs, and awesomely slow-roasted Wagyu beef brisket that just melts in your mouth. For this special tasting, we were served Virgin Cucumber with Lychee Mojito, which was just refreshing. This mocktails really got my two thumbs up. Overall, I am truly impressed with Chef Mingozzi and his team effort to bring us their interpretation and creativity in presenting black Truffle influenced dishes. The appetizers, Western (Italian) and desserts are just amazing. What a memorable Iron Chef esque experience. Please note that this OSCAR'S Truffe promotion is only for a limited time only. 5 – 8 February 2015. Complimentary shooter glass of Grapa, a uniquely grape-based Italian drink which paves the way for an indulgent evening of truffles. Thank you to Chef Michele Mingozzi, Oscar's F&B Team and Conrad Centennial Singapore for the wonderful evening. Black Truffle is just so luxurious and exquisite, but can be an acquired taste for some. A chef that can utilize this highly expensive ingredient and make it work in different international cuisines is also a rare find as the flavor is so distinct. The pictures you shared look so delicious, especially that White Noodle with Black Truffle and Olive Oil Sauce. Thanks for sharing your great find, looking forward to your next blog post. Hi All Graduates | German Translation Service, Thanks for your feedback. Cheers! !